"Pancakes" aside, the Olympus M.Zuiko Digital 45mm f/1.8 is one of the smallest lenses in the Micro Four Thirds system, which is no mean feat considering that this is a fast-aperture telephoto lens. One might think that this miniaturisation may have had some negative side effects on its performance but thankfully, this is not the case. Optically, the lens excellent with centre sharpness being commendable even wide open, and overall sharpness being nothing short of astounding in the f/2.8-f/8 range. Distortions and chromatic aberrations are both minimised, and vignetting isn't a problem either, especially at f/2.8 and beyond. The only fly in the ointment is the so-so close-up performance - but given that the Olympus 45mm f1.8 is not claimed to be a macro lens, this should not be viewed as a serious flaw. The lens is very pleasant to use, with focus speeds being good even on older Micro Four Thirds bodies, and blazingly fast on the newer ones. Despite having an electronically coupled focus ring, it also lends itself well to manual focusing, and although it's a plastic-barrelled lens its rangefinder-esque look, size and proportions will likely appeal to a lot of old-school photographers out there. Those who wish to use the Olympus M.Zuiko 45mm f1.8 on a Panasonic camera body should take note that it does not offer in-lens image stabilisation, although they will probably not find this a huge problem given the fast maximum aperture that allows the use of sufficiently fast shutter speeds in most lighting conditions. 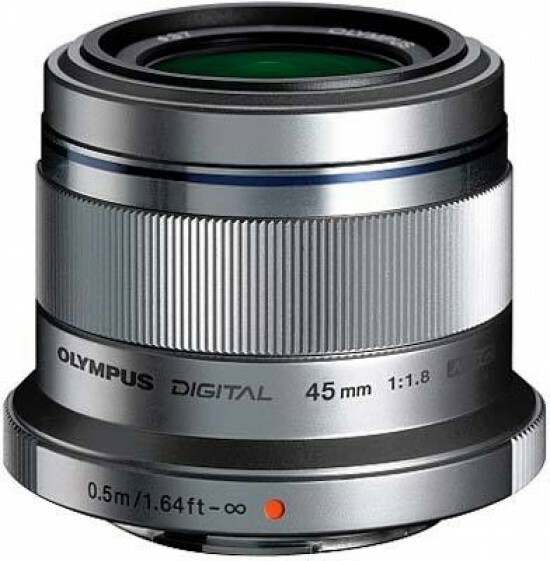 Priced at well under £300 in the UK and usually not much higher than $400 in the US, the Olympus 45mm f/1.8 represents excellent value for money to anyone on the lookout for a fast short telephoto lens for their Micro Four Thirds camera. Those who wish to shoot macros should, however, also take a look at the Leica DG Macro-Elmarit 45mm F2.8 ASPH. MEGA O.I.S. lens. Priced at £580/$670 it's a lot more expensive than the Olympus, and at f/2.8 it's more than a stop slower as well, but for the extra cash it offers a lens-based optical image stabiliser, a focus limiter and a 1:1 reproduction ratio. Another alternative is the Zuiko Digital ED 50mm f/2 Macro with a FourThirds-to-MicroFourThirds adapter, which combines an f/2 maximum aperture with exceptional performance and a high magnification factor - but that lens is much slower and louder to focus and can cost a lot more than the 45mm f/1.8 especially if you do not yet have the adapter needed to mount it on your MFT camera.